Basel, October 30, 2017 - New evidence on the efficacy of the innovative biologic Cosentyx® (secukinumab) demonstrating its potential to reduce structural disease progression in patients with specific rheumatological conditions will be presented at the 2017 ACR/ARHP Annual Meeting in San Diego, United States. The Cosentyx late breaking presentations will include new 4-year data from the MEASURE 1 study in patients with ankylosing spondylitis (AS), and 24-week data from the FUTURE 5 study in patients with psoriatic arthritis (PsA), two debilitating autoimmune diseases with a high risk of mobility loss. "Maintaining mobility is our hope and vision for every patient with chronic inflammatory diseases such as AS and PsA." said Vas Narasimhan, Global Head, Drug Development and Chief Medical Officer, Novartis. "Reducing radiographic progression would be a strong signal for patients who hope to stay mobile as this would result in a significant improvement of their quality of life." Cosentyx is a fully-human, targeted biologic approved for patients with AS, PsA, or psoriasis (PsO). Cosentyx is the first and only fully human monoclonal antibody that selectively neutralizes interleukin-17A (IL-17A), the key cytokine involved in the pathogenesis of AS, PsA and PsO-. Today, Cosentyx has been used by more than 100,000 patients worldwide. Across all three indications, Cosentyx has demonstrated rapid and sustained efficacy as well as a consistently favorable safety profile,,, including close to zero injection site reactions or associated pain,. 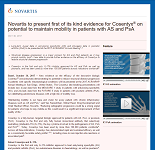 Cosentyx is the first and only IL-17A inhibitor approved to treat ankylosing spondylitis (AS) and psoriatic arthritis (PsA), two autoimmune diseases in rheumatology, as well as psoriasis. Cosentyx is a fully-human, targeted biologic that specifically inhibits the IL-17A cytokine which plays a significant role in the pathogenesis of AS, PsA and plaque psoriasis-. IL-17A is a key cytokine involved in the inflammation of the entheses - the sites where tendons or ligaments connect to the bone-. Cosentyx is the first IL-17A inhibitor approved in more than 70 countries for the treatment of active AS and PsA, which includes the European Union countries and the US. Cosentyx is also approved for the treatment of PsA and pustular psoriasis in Japan. Cosentyx has a proven safety profile with close to zero injection site reactions or injection site associated pain,. Ankylosing spondylitis (AS) is part of a family of life-long inflammatory diseases, which also includes psoriatic arthritis (PsA). AS is characterized by inflammation of the sacroiliac joints and new bone formation caused by increased levels of IL-17A, with severe cases progressing to irreversible spinal fusion,. AS can cause serious impairment of movement in the spine and physical function, which has an impact on quality of life. People in their teens and twenties, particularly males, are affected most often,. PsA is a debilitating autoimmune diseases with a high risk of mobility loss. Symptoms of PsA include joint pain and stiffness, skin and nail psoriasis, swollen toes and fingers, persistent painful swelling of the tendons, and irreversible joint damage. Up to 40% of people can suffer from joint destruction and permanent physical deformity. IL-17A plays a significant role in disease pathogenesis of AS, PsA and plaque psoriasis, which is significant as up to 30 of psoriasis patients will develop PsA during their lifetime and as many as 1 in 4 people with psoriasis may have undiagnosed PsA. MEASURE 1 is a 2-year, multicenter, randomized, placebo-controlled Phase III study assessing the efficacy and safety of Cosentyx in patients with active AS. A total of 290 of 371 patients completed the trial, after which 274 patients were invited to enter a 3-year extension period,. Primary endpoints assessed superiority of Cosentyx against placebo at Week 16 in the proportion of patients achieving at least a 20% improvement in the ASAS 20 response criteria,. From Week 16, patients in the placebo arm of the study were re-randomized to Cosentyx 75 mg or 150 mg based on ASAS 20 response, with non-responders switched at Week 16, and responders at Week 24,. In total, 83/87 and 95/100 patients who enrolled in the extension and randomized to Cosentyx 75 mg and 150 mg respectively completed 156 weeks. In the study, participants (n=996) with active PsA were randomized to receive Cosentyx at 300 mg with loading dose (LD), 150 mg with LD, 150 mg without LD, or placebo. All groups received Cosentyx or placebo at baseline (BL), weeks 1, 2, 3, and 4, and then every 4 weeks. At week 16, placebo non-responders (patients with <20% improvement from BL in tender or swollen joint counts) were switched to Cosentyx 300 mg or 150 mg; remaining placebo patients were switched at week 24. The primary endpoint was ACR20 at week 16 and the key secondary endpoint was radiographic structural progression, as measured by mTSS, assessed by two blinded readers, based on hand/wrist/foot X-rays obtained at BL, week 16 (non-responders), and week 24. With nearly 1,000 patients included in the Phase III study, FUTURE 5 is the largest randomized controlled trial (RCT) of a biologic conducted in PsA. Braun J et al. Secukinumab demonstrates low radiographic progression and sustained efficacy through 4 years in patients with active ankylosing spondylitis. Presented as a late-breaker at the Annual Meeting of the American College of Rheumatology. November 7, 2017. Mease P et al. Subcutaneous Secukinumab Inhibits Radiographic Progression in Psoriatic Arthritis: Primary Results from a Large Randomized, Controlled, Double-Blind Phase 3 Study. Presented as a late-breaker at the Annual Meeting of the American College of Rheumatology. November 7, 2017. Dougados M et al. Spondyloarthritis. The Lancet. 2011;377:2127-37. Girolomoni G et al. Psoriasis: rationale for targeting interleukin-17. British Journal of Dermatology. 2012;167:717-24. Reich K et al. Secukinumab, a fully human anti-interleukin-17A monoclonal antibody, exhibits minimal immunogenicity in patients with moderate-to-severe plaque psoriasis. British Journal of Dermatology. 2017;176:752-58. Kopf M et al. Averting inflammation by targeting the cytokine environment. Nature Reviews Drug Discovery. 2010;9:703-18. Onishi RM et al. Interleukin-17 and its target genes: mechanisms of interleukin-17 function in disease. Immunology. 2010;129:311-21. Smith JA et al. Review: The Interleukin 23/Interleukin 17 Axis in Spondyloarthritis Pathogenesis: Th17 and Beyond. Arthritis & Rheumatology. 2014;66:231-41. Ward MM et al. American College of Rheumatology/Spondylitis Association of America/Spondyloarthritis Research and Treatment Network 2015 Recommendations for the Treatment of Ankylosing Spondylitis and Nonradiographic Axial Spondyloarthritis. Arthritis Care & Research. 2016:68:151-166. Dean LE et al. Global prevalence of ankylosing spondylitis. Rheumatology (Oxford). 2014; 53(4):650-7. American College of Rheumatology (ACR) website. Spondyloarthritis. Available at: http://www.rheumatology.org/I-Am-A/Patient-Caregiver/Diseases-Conditions.... Last accessed October 2017. Mease PJ et al. Managing patients with psoriatic disease: the diagnosis and pharmacologic treatment of psoriatic arthritis in patients with psoriasis. Drugs 2014; 74:423-41. Anwar AH, Diamond H. Psoriatic arthritis: practice essentials, background, pathophysiology and etiology. Medscape reference website. Available at: http://emedicine.medscape.com/article/2196539-overview#a6. Last accessed October 2017. National Psoriasis Foundation. Could You Have Psoriatic Arthritis? Know the Signs. Available at https://www.psoriasis.org/psoriatic-arthritis/know-the-signs. Last accessed October 2017. Braun J et al. Effect of secukinumab on clinical and radiographic outcomes in ankylosing spondylitis: 2-year results from the randomised phase III MEASURE 1 study. Annals of the Rheumatic Diseases 2016;doi: 10.1136/annrheumdis-2016-209730.